Expertly recased in contemporary sheep, rebacked. Browning and light dampstaining. A very good copy. First edition. 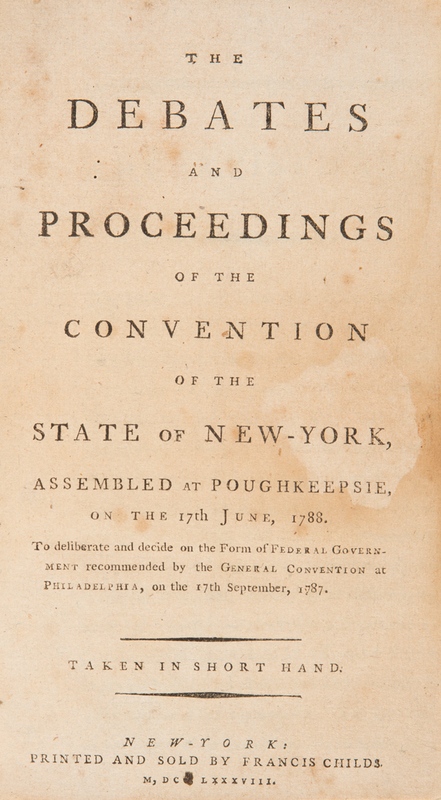 This rare volume documents Alexander Hamilton’s heroic efforts to secure New York’s ratification of the Constitution. In September 1787 the General Convention in Philadelphia sent the proposed Constitution to the states for ratification. One of the most contentious battlegrounds was New York. Without its ratification the new nation would be crippled from the outset. Alexander Hamilton, leader of the New York Federalists, laid the groundwork for his campaign by publishing a series of Federalist papers in newspapers beginning in October 1787. But by June 1788 he saw that the effort was in trouble. Hamilton wrote to James Madison, “the more I can penetrate the views of the anti-federal party in this state, the more I dread the consequences of the non adoption of the Constitution by any of the other states, the more I fear an eventual disunion and civil war.” When the New York convention commenced that month, ratification was in jeopardy: Anti-Federalist delegates out-numbered Federalists 47 to 20. An experienced and eloquent courtroom advocate, Hamilton marshaled every argument available to the Federalists. In these speeches Hamilton presents in detail the central themes of the debate: balance of powers, federalism, the bicameral legislature, representation and apportionment, the power of the executive, defense, and so on. This rare volume presents many of the speeches of Hamilton, John Jay and other Federalists, as well as those of George Clinton and the other anti-Federalists. REVISED BY HAMILTON FOR PUBLICATION. “From a letter in the Lamb papers (NYHS) it appears probable that at least Hamilton, Jay and Lansing revised their speeches, though Francis Childs, the reporter, virtually in his preface says that no such revision took place.” (P.L. Ford, Pamphlets on the Constitution of the United States). Thanks to Hamilton’s efforts, New York ratified the Constitution by a vote of 30-27. This rare volume represents a pivotal moment in the establishment of the new nation. VERY RARE. Only two other examples (the Streeter copy and a rebound copy with library stamps) appear in the auction records of the past century.